What a month! April was jam packed, both with fitness activities as well as work and social events. This past month I ran two races – the Cherry Blossom Ten Mile Run and the Jaguar 5k – and focused on increasing my speed, consistently weight training, and overall, trying to live a healthy, less stressful life. The first half of the month I was much more successful with the relaxation component of my April goals, while during the second half of the month I was very successful in increasing my running speed. A month ago, I set three very specific goals, and while I made progress towards reaching all of them, I was more successful in meeting some more than others. Yesterday I completed my 60th mile for the month, and ended the month having completed 60.43 miles. 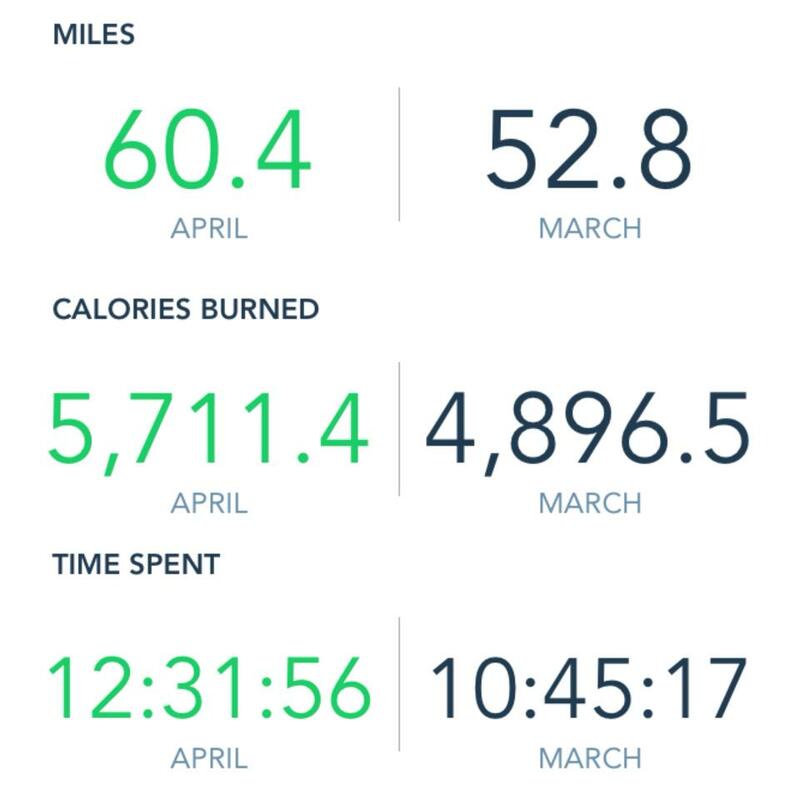 Not only did I log more miles in April than I did in March, but I also increased my calorie burn during cardio activities, and spent more time training in April than I did in March. I was much more consistent with practicing yoga during the first half of the month than I was during the second half of the month. Despite having had a follow up appointment with my neurologist last Monday, I haven’t practiced yoga since I last saw him. Bad patient, I know. I was much more consistent in April than I was in March with my weight training, especially during the second half of the month. Based on the success and progress I made inApril, my May goals are very similar to my April goals. Because I have so much on my calendar (we’ll be out of town three out of the next five weekends), I want to focus on maintaining the healthy practices I worked on building during April, and to make yoga a higher priority than I did during the second half of April. 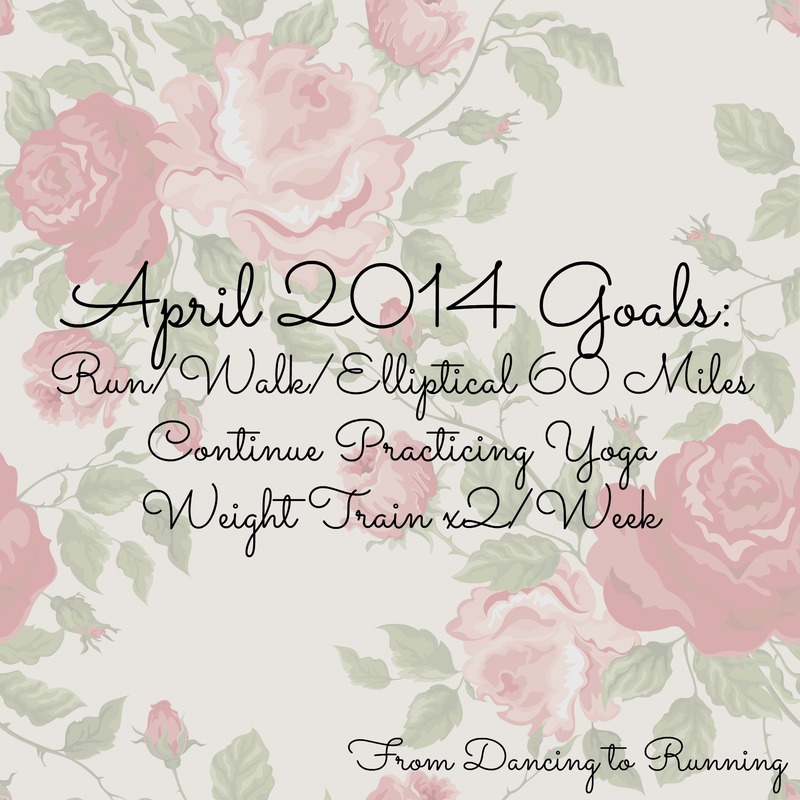 Since I met my April goal of 60 miles, I’m challenging myself to log an additional five miles in May. While this may seem like an easy task given how small of an increase it is, my longest training run this month is scheduled to be 6.5 miles, whereas my longest run in April was ten miles during the Cherry Blossom Ten Mile Run. Between my runs being of a shorter distance this month, and how busy our calendar is, adding an additional five miles will definitely be a challenge. 2. Make practicing yoga a higher priority. After neglecting yoga for the second half of April, I need to focus on making it a priority again. I truly believe that one of the reasons why I was able to successfully increase my running speed is because of the weight training that I’ve also been doing. I know that continuing to weight train will be important, especially as my half marathon training mileage increases. 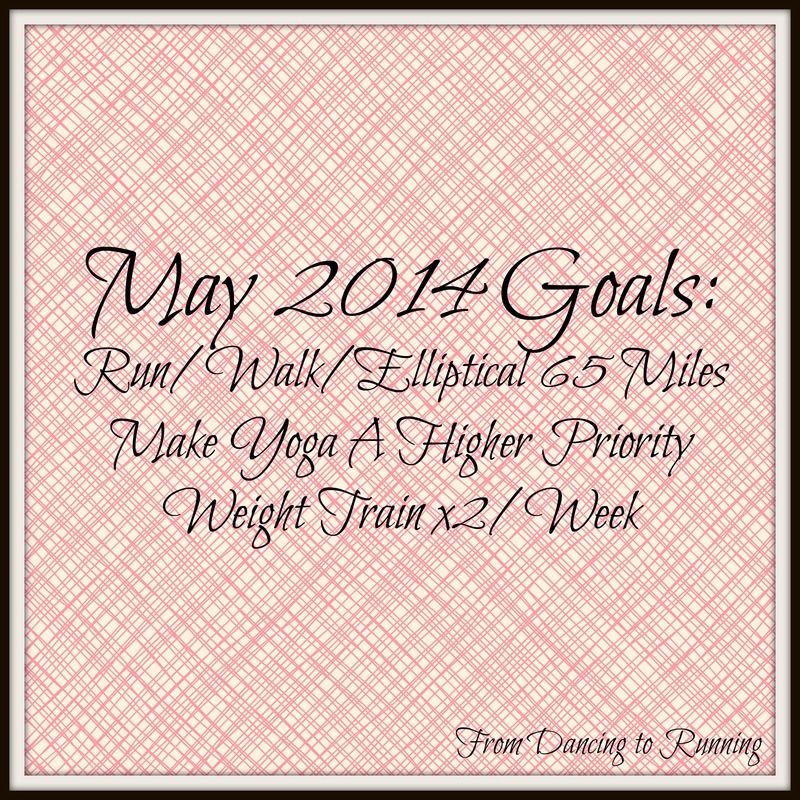 QOTD: What are your goals for May? Also, congrats to Didi M. from DISTherapy on winning the Custom Tutu Giveaway! Thanks to all who entered, and hopefully it won’t be too long before I host another giveaway! I need to get into a better routine about working out right when I get home from work, but the couch is always so inviting! Good job on the goals and keeping going with the May goals! I loved the grades and you did a really good job keeping with your goals! My goals for May are to finish the alpha phase of T25 while running, strength training and doing yoga at least 2x for each. Good luck in May! Best of luck to you as well, Sara! Congrats to Didi for the win! Good luck with the yoga this month. Looks like you did pretty well with your other goals! Keep on keeping on girl! I’ve noticed weight training helps me increase my running speed, too! I recommend you regularly practice yoga, too, as I’ve found that helps me with recovery after runs. I definitely need to be more diligent about it. I like how you set specific goals each month! For May, I’m also setting a goal to weight train twice a week. I love that you have a relaxation component to your goals. Very few people think of that, including myself. Its been very necessary lately. Great and realistic goals you have. I’ve become more into yoga the last few months as well. Have you tried Dancing Mind in Falls Church? I love their yoga sculpt class. I’m glad we connected and can’t wait to meet up in person. Other than one hot yoga class out in San Diego last summer, I have yet to try any other classes. I’ll have to look into that studio. Thanks for the suggestion, Deborah! These are awesome goals! I need to focus on yoga and strength training more too, because as of right now, I’m not doing either. I’ve been both to be extremely beneficial. Hopefully you do as well.